FARGO, N.D. (AP) — As the Red River slowly started to recede Monday and fears of major flooding diminished, Fargo residents were left to deal with another problem: environmental hazards that linger long after the waters decline. Floodwaters can be noxious brews of pesticides, sewage, garbage and animal carcasses that foul drinking water, spread disease and damage fish habitat. Although the Red River didn't do nearly as much damage this year as during record-breaking floods in 2009, authorities say danger could persist. "Fuels, chemicals, all kinds of things find their way into the water system and it's a huge environmental risk," said Keith Berndt, engineer for Cass County, which includes Fargo and West Fargo. Towering mounds of sand on the outskirts of Fargo are a vivid symbol of those hazards. The 70,000 tons of moist sand had been packed into bags that were stacked along the Red River a year ago, when flooding damaged hundreds of homes, forced thousands to evacuate and caused $100 million in damage. Soaked by contaminated water, the sand is usable only for limited purposes such as road and building construction. Those piles soon will get even bigger, as the 1.5 million sandbags used to hold this month's floodwaters are removed and emptied. Residents who ask for a truckload to use around the house are refused. "We don't want people to use it in their kids' sand boxes or anywhere else they could come in direct contact with it," said Myron Bergland, environmental health manager for Fargo-Cass Public Health. The Red crested Sunday at just under 19 feet over flood stage — 4 feet lower than last year — without doing serious damage to homes and other buildings. Only some baseball fields, farmland and backyards were submerged. Fargo Mayor Dennis Walaker said he would pop the champagne later this week to celebrate his city's success in fighting the flood. He noted that while most floods have at least "one day of chaos," that didn't happen this year. "The big thing is relief," he said Sunday. But he added, "We need at least another week here before we get it to the level we wanted it to be." Last year's disaster swept pollutants into the Red and its tributaries, although the sheer volume of water and accelerated flow rate weakened the effect, said David Glatt, environmental chief for the North Dakota Department of Health. Even as officials were ready to declare victory in this year's flood fight, Glatt emphasized the importance of safeguarding drinking water supplies, particularly in rural areas where private wells may have been submerged. No large-scale water-quality testing was conducted in 2009, but officials monitored hospital emergency rooms and found no upswing in visits that would have indicated an outbreak of flood-related sickness, Glatt said. Officials credited experience and public education with preventing serious environmental health problems. "We've had a little familiarity with floods in recent history," Glatt said. "People have had an opportunity to prepare and minimize the harm." 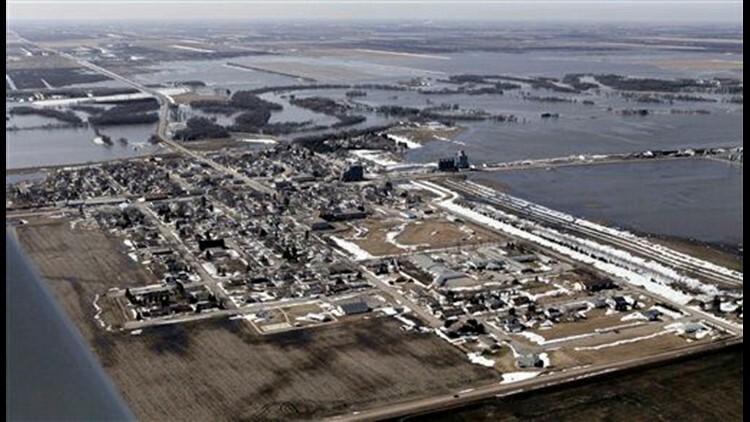 Cities in the region have reduced their exposure to contaminated water over the years by elevating wellheads or surrounding them with dikes to keep floodwaters out. But numerous wastewater treatment systems were overwhelmed during last year's flooding, forcing officials to dump raw sewage into the rivers. A few have requested permission to do likewise this year if necessary. Private well users are particularly vulnerable. State and local agencies have provided information about protecting residential wells and stand ready to help disinfect contaminated ones. Fargo-Cass Public Health last week warned owners of submerged wells not to use the water for drinking or cooking until it can be tested. Agencies also urged people to secure household and farm chemicals, fuel tanks and other potential sources of pollution. Dead livestock is a particular threat in Great Plains ranch country. Some 90,000 head of cattle were lost during last year's calamity. They're a potential source of pathogens that can pollute wells and surface waters. "Even a typically normal, healthy cow has E. coli bacteria in its gut," Bergland said. "You need to properly dispose of the bodies before they drift away in the water." State agencies, including the North Dakota National Guard, helped retrieve bloated carcasses and advised ranchers how to deal with them. It's not as simple as it sounds. If buried, the bodies must be placed above the water table under at least 4 feet of loamy, clay soils. If burned, only organic fuels such as wood can be used and a state permit is required. Gov. John Hoeven said Sunday there have been few if any flood-related livestock deaths so far this year, though more flooding may be in store farther west of the Red River Valley, where most of the state's ranches are located. Once immediate flood dangers have passed, ecological aftereffects can persist for months or years. Phosphorus fertilizers that wash into rivers and lakes can stimulate growth of algae blooms that reduce oxygen levels and kill fish. Heavy soil erosion along riverbanks degrades fish habitat and spawning areas, particularly in streams that feed larger rivers such as the Red. "Think of trying to breathe in a dust storm," said Henry Van Offelen, a scientist with the Minnesota Center for Environmental Advocacy. "That's what a big sediment plume in water is for fish." But the environmental setbacks are not always a total loss. Some of the leftover bag sand can be used in landfills to prevent liquid pollution from seeping into groundwater. If clean enough, the sand can be mixed with salt and spread on icy roads. And the county has sold about 20,000 tons to contractors for fill at building construction sites and for road resurfacing. Price: $3 a ton. "We're not making of lot of money, but we're recouping a little of the cost of the flood," Berndt said.